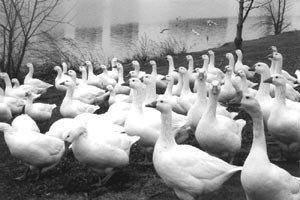 Why Would Anybody Want to Destroy the Homes of a Bunch of Harmless, Beautiful Geese? Cambridge has its own version of Bostons public garden swans. The biggest difference is that our magnificent Charles River white geese dont ask the government to feed them and dont require the government to house them in the winter. Another difference is that the geese are a lot safer than swans. If you dont threaten their homes, they wont bother you. All that they need is to be let alone. And you can admire them at will. Any day, travel down Memorial Drive to the B.U. Bridge area, most commonly in the park across from the Hyatt, near the boat dock at Magazine Beach or in the water, and you will see a number of beautiful white geese. I am told that they were counted at 52 in the summer of 97. When I try to tell most people that these beautiful geese are in danger, they only answer with incredulity. People cannot conceive that there are people irresponsible enough to attack these beautiful creatures. A totally different story appears if you talk to a tiny number of people who claim to be friends of Magazine Beach. Many of these people fought, unsuccessfully, to put large trailer trucks on Memorial Drive a few years ago. Many if not most of them, seem to make their livings from development or from planning for development. Most people, when looking at the M.D.C. properties on the Charles River, see a nice, quiet, underdeveloped area which could use a little bit of work. When developer types look at the Charles River, they use a word which is their greatest swear word. They use the word under utilized. It is usually said with a delicate shudder. You see, the developer types have plans for the Charles River. I have seen the plans drawn up for them by the Development Department of the City of Cambridge. You heard me right: the Development Department of the City of Cambridge has drawn up plans to develop the M.D. C.s Charles River. The developer types have plans to put in a new, better, boat dock at Magazine Beach, a dock which could be used by tour boats. The developer types have plans for soccer fields, many soccer fields. If you ask, particularly if you know what to ask and how to ask, you might get the developer types to tell you about the large number of mature trees they will tear down for the soccer fields. The plans do not show the trees being destroyed. The developer-types have plans for magnificent walkways down the Charles, not exactly gold plated, but pretty close to it. The developer-types dont mention the homeless who live next to the B.U. Bridge. The plans of the developer-types dont show the encampment of the homeless. Something stands in the way of the developer types magnificent plan to counter the threat of under utilization (shudder) of the area on both sides of the B.U. Bridge: those magnificent geese. Those magnificent 52 geese nest in the area where this magnificent walkway is proposed. Those magnificent geese nest between the pollution control plant and the Charles River. The plans of the developer types dont show the nesting area of the 52 magnificent white geese. So you see, something must be done about these harmless beings who suddenly have become anti natural threats to the environment in the eyes of the developer types. So you see, these well organized individuals show up in meetings, shuddering about the horrors of these magnificent animals. They get very indignant while shuddering. They even, occasionally, get an appropriately biased article in a newspaper. The developer-types have learned, horror of horrors, that the geese have bodily functions. The developer types have learned that these under utilized areas have levels of cleanliness lower than the state of someones living room. 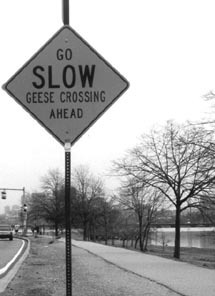 The developer types have learned that those geese have the nerve to defecate. The developer types have learned that the geese dont pay rent! If you think I am being silly, you have not caught these developer types in action at planning sessions for the Charles River. What do the people who love the geese say in response? The people who love the geese do not show up at meetings. The people who love the geese know that nobody would be so irresponsible as to destroy the geese. The people who love the geese have a great faith that most human beings are decent, and they are right. But most human beings do not make meetings. What do the neutral people think? Well, only one side is organized. The other side thinks destruction of the geese to be unthinkable. So the neutral people only hear about these white things that defecate and dont pay rent. Is the behavior of the developer types sick? Sure it is sick. Is the behavior of the developer types effective? Deadly. Are those geese in trouble? Youd better well know it. They have a very determined enemy. The enemy looks like "the right kind" of people. The enemy works behind the scenes and does not go public any more than the enemy can help until it is too late. Then, as it has happened so many times in Cambridge, well-meaning people wonder why they were not informed. They were not informed because, if they were informed, they would object. © 1999 Robert J. La Trémouille. Fair use allowed in accordance with copyright law.